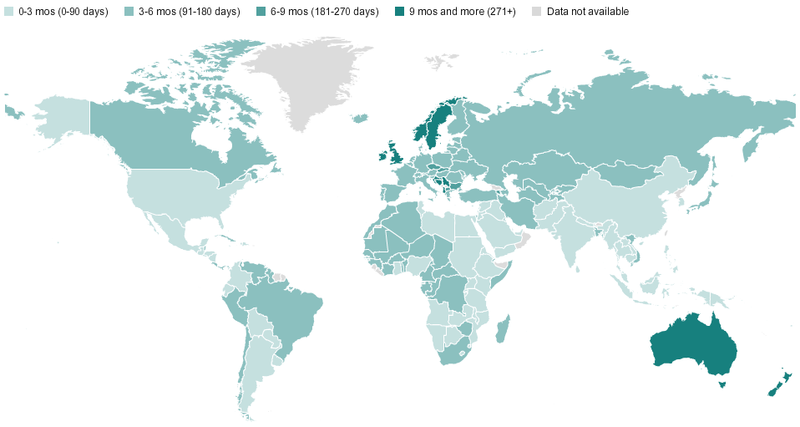 Ah, nothing like a map of worldwide maternity leave to remind you how little the US–for all its “family values” rhetoric–actually cares about working families. Click here for larger version and here to hover over each country. As this interactive feature from NPR shows, the US is not just the only developed nation that doesn’t guarantee at least some paid maternity leave, it’s one of the only countries, period. We’re behind some 177 countries on this issue. NPR’s map is focused on maternity leave policies because paternity leave policies are harder to pin down. They note, “In some cases, fathers can tap into the same benefits that mothers get; in other cases they have time specifically dedicated to them; and in many countries, fathers don’t have any time allotted to them at all.” The great parental leave policies in Australia and Sweden seem like utopian dreams in the US. They shouldn’t. In theory, feminists and “family values” conservatives should be able to unite on this issue. (Fox New’s Megyn Kelly is on the right side at least.) And some states are slowly but surely moving in the right direction–though it still looks pretty bad out there. Still, Sharon Lerner recently suggested that we might be able to pass a national paid leave law by 2019. Here’s hoping. Update: Just noticed this map was posted while ago, but still–we should be talking about the sad state of US maternity leave all the time until it changes!